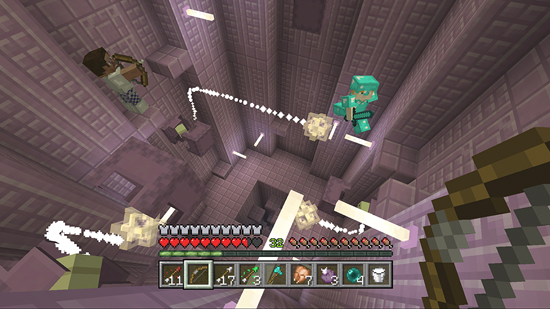 The largest Minecraft update of the year will bring Elytra wings for gliding,Amplified Terrain, End Cities, the Dragon's Breath potion ingredient. the update will be available for PS4 PS3 XOne X360 PS Vita and Wii U bring the consoles up to date with the PC version of Minecraft. 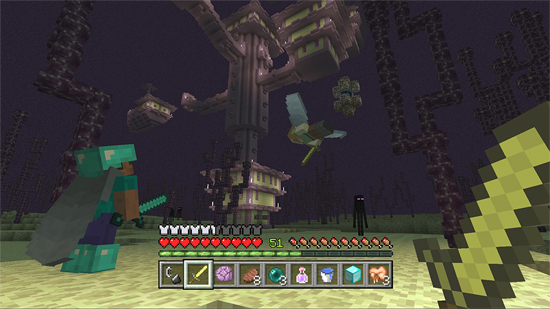 An improved user interface (UI) brings new mobs, items, blocks and status effects. Gamers will be presented with the Elytra in The End the third and final Minecraft dimension. The End will be updated with new End Cities, new End Ships, new Chorus Plants, new Chorus Flowers and new Purpur blocks with new Shulker enemies that hide near purpurs. Lingering Potions can be created with the new Dragon's Breath ingredient. Minecraft will give players an early preview from today with more promised on the December release date. The Christmas Holiday update is free to all console owners of Minecraft. Pocket and Windows 10 editions have already been updated and a new Apple TV Minecraft is due before January.